Sunday was a day to stay inside: grim weather and an even grimmer D&V bug I'd picked up from my nephew during half-term hols in Cornwall. 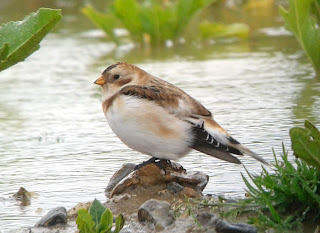 So it was that I was languishing in my sick bed at 11am when a text alerted me to a serious sighting reported on the local news group the previous evening: a male Snow Bunting less than 6 miles away! Cycling – in the driving rain – in the state I was in was out of the question, though I did manage to drag myself out of bed and drive over to see it. This morning, after a couple of Panadol to quell the lingering light-headedness, I set off on the bike. It was a spectacular autumn morning and the 16.8 miles weren't too bad, all things considered. The return leg was particularly easy, given that Snow Bunting (164) was now safely OML!